The term "Floating Floor" is a relatively new expression that has gained favour in more recent years but the method of supporting a floor structure on resilient bearings off a structural slab has been applied and developed by Christie & Grey over much of its 90 year history. Examples of this work still in existence date back to the early 1960's. The development of structural materials has enabled architects and engineers to make more and more use of lightweight structures in modern building designs. This has highlighted the need to consider carefully the noise, shock and vibration transmission loss characteristics of these structures. In particular, for high rise buildings, the proximity of noisy/high activity areas to quiet/critical areas significantly increases the potential for use of acoustic and vibration isolation materials, including floating floors. For example, it might be necessary to isolate a plantroom from office accommodation below, reduce external noise such as low flying aircraft penetrating the roof of a building or reducing the transmission of footfall impact noise from one apartment to another below. SRS floating floor systems have been used successfully in applications such as Plantrooms, Offices, Prestigious Apartment Blocks, TV, Radio and Recording Studios, Cinemas, Concert Halls and Audiometry rooms. Natural rubber bearings are true elastomers and are applied within their linear stiffness range to achieve the required design performance, low creep and resultant design life. All steel parts are galvanised and elastomer bearings are unaffected by water, vermin or other pests. Sound transmission loss is dependent upon concrete thickness and air space. Typically a type SRS floating floor can be designed to provide a loss of at least 20-25 dB in excess of that provided by a single concrete slab construction. 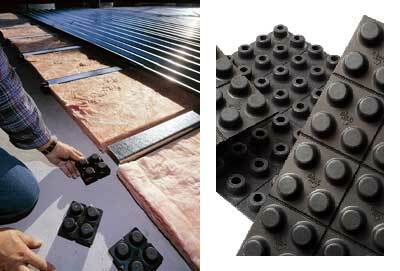 Under the design condition, the life of a SRS floating floor system will be at least the life of the building.